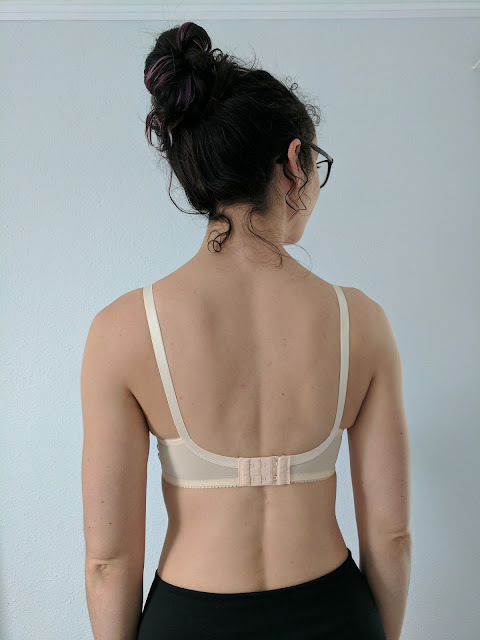 In my Watson bra fit post, I mentioned that I sewed a fifth one that fits fantastically. Here it is! I finally eschewed all black everything, partially because I no longer felt like I needed to keep all of the variables constant for fit experimentation, but also because I FIN.ALL.Y bought some non-black powernet and elastic. 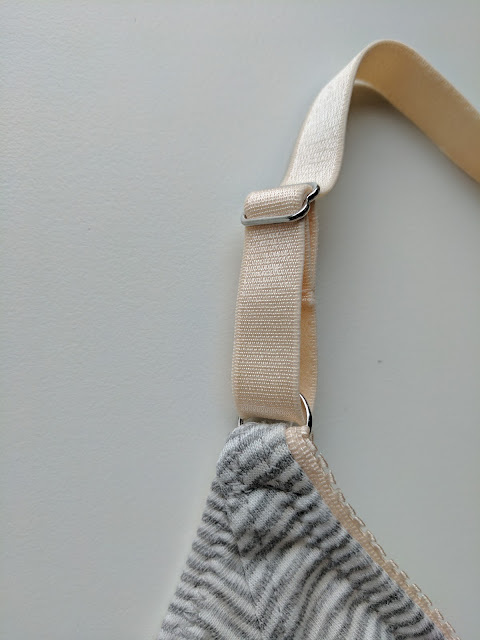 (With like 4 types of elastic and 3 kinds of fabric and lining per bra, plus hardware, adding another color to your stash is a big commitment!) I actually stocked up on supplies in two more colors: a nice rosy pink and the champagne beige used here. 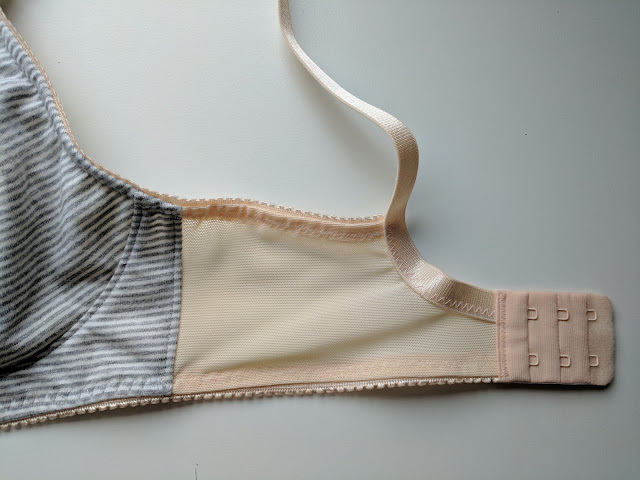 I knew I wanted to use this striped jersey for a Watson once I nailed the fit, and I was picturing using pink with it, but I ended up much preferring the beige so here we are! Since the jersey doesn't have as much elasticity as the black fabric I used for my other Watsons, I lined the cups with powernet, and it has just the right amount of support. 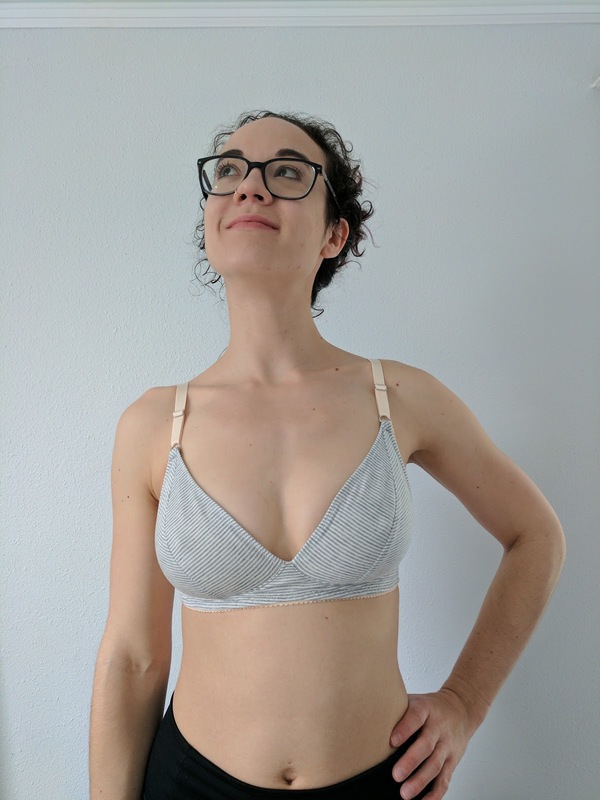 I hid the seams in the cup by assembling the jersey and powernet cups separately and then sewing them together as I added the neckline elastic. 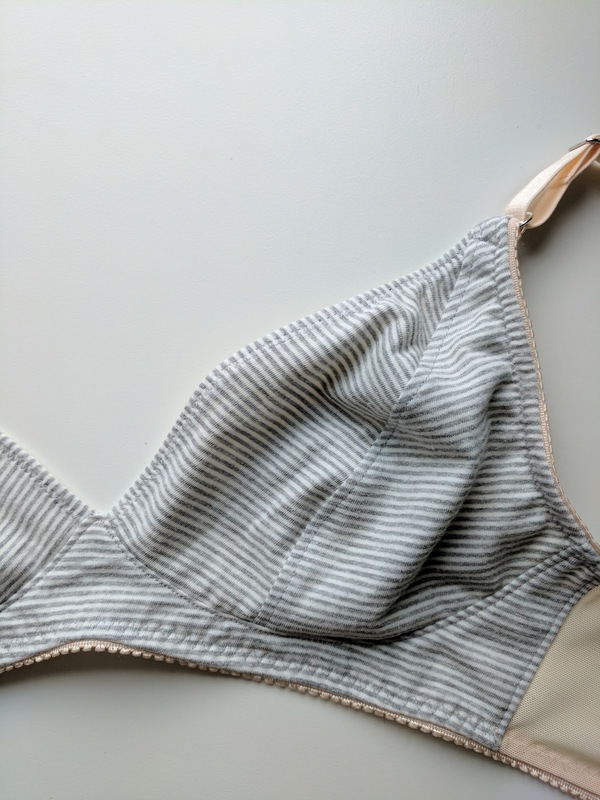 The other seams (under the cup and at the side seam/bridge) are raw and just topstitched down, but I really like having the inside of the cup smooth and don't mind that the rest isn't as clean. There is some horizontal wrinkling on the cradle, but it's only on the jersey layer. I think the relative stretchiness of the jersey compared to the lining underneath is causing it, and vertically stretching the jersey a bit when basting to the lining would likely solve this in the future. I got fancy with my thread and switched colors as I transitioned from the peachy band to the gray fabric, and I'm really happy with how everything blends in. I'm so happy to have a very solid version of the Watson pattern now. 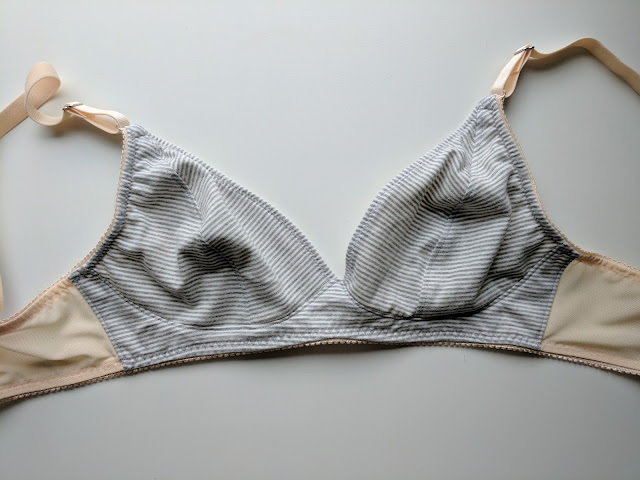 In addition to being comfy and relatively supportive, it also has a lower plunge than my underwire bras so it works great with super deep V-necks. Time to transfer to durable card stock and make more soon! OOOOh this is nice! The beige goes unexpectedly really well with the stripe too.